You are here: Home / Blog / Blog Single Author Big / News / New T-shirts on the way! We now have custom shirts on order! Why is this great news? Because now it’s easy for all our customers to order custom shirts! Our new digital press system consists of a full digital 4-color + white fabric printing on a selection of shirts. We can order Mens, Womens, and Kids shirts in short sleeve, long sleeve, and tank tops! Available in White, Black, Red, and Blue shirts in most styles, we can do orders with a minimum of just 1 shirt – 999 shirts. Sizes S-2XL, and because this is a digital system we can print high quality full color reproductions – that means you can print a photograph if you’d like. NO extra charge per color. 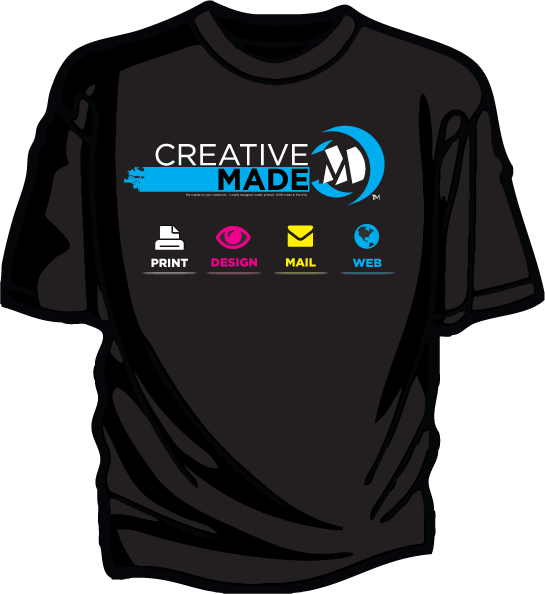 https://www.creativemade.com/wp-content/uploads/2013/02/CM-Tshirt-ReachCustomers_01p01.png 594 545 Creative Made https://www.creativemade.com/wp-content/uploads/2015/07/CM-LogoIcon-White-051114-200x100.png Creative Made2013-02-22 22:44:342015-11-07 09:40:11New T-shirts on the way!